RDD Center can help free you from Hydrocodone / Vicodin Addiction. Hydrocodone / Vicodin are known by various other brand names (see below). Vicodin is an antitussive opiate (hydrocodone) intended for treating severe pain or cough relief. Hydrocodone is a widely prescribed drug in the U.S. and has several hundred variants. Vicodin consists of a combination of hydrocodone and acetaminophen and is one of the most prevalent and abused of the hydrocodone drugs. It is also known as Anexsia, Lorcet, Lortab, Norco and Xodol. When combined with ibuprofen instead of acetaminophen, it is identified as Vicoprofen (or Vicoprophen). Typically, Vicodin is abused orally in combination with alcohol. Call us at 1-888-825-1020 or contact us to learn more about how we can help you overcome Vicodin addiction. Extended use of Vicodin can lead to increased tolerance and addiction. Liver toxicity is a risk of Vicodin addiction and increases for those who have not built up a tolerance to the drug overtime. Vicodin withdrawal can be a painful process particularly after heavy use. Symptoms are typically experienced within hours of stopping the drug and can last up to several weeks after depending on the intensity of Vicodin use. Symptoms of Vicodin withdrawal include body aches in the bone and muscle , back aches, watery eyes, sneezing, insomnia, sweating, diarrhea, runny nose, anxiety, leg spasms, vomiting, chills (goose bumps), pale and clammy skin, yawning, increased blood pressure, dehydration, convulsions and mood disturbances (anxiety, irritability, thoughts of suicide). The RDD Method™ for Vicodin detoxification is a medical procedure perfromed under anesthesia that eliminates most of the withdrawal symptoms. During the procedure the patient is given medication to relax and then put under light, general anesthesia for approximately 60 minutes. Following the procedure, recovery begins under direct medical supervision. The patient’s vital signs and overall physical and mental reactions to these medications are closely monitored during the detox procedure. In the days that follow, the patient often sleeps more than usual. 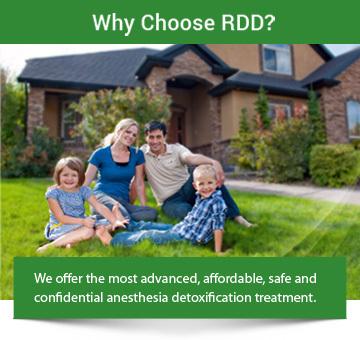 Administered by medical professionals as part of a long-term drug-addiction recovery strategy, The RDD Method™ is shown to be significantly more effective than other courses of Vicodin addiction treatment. How do I know if I am addicted to Vicodin? Even short-term users may require a detox program in order to successfully discontinue use because Vicodin is so addictive. Addicts typically require higher doses of the drug and experience cravings for Vicodin between doses. How long does Vicodin detox take? The length of the Vicodin detox process varies depending on the pattern of typical use and on individual differences. The most severe withdrawal symptoms occur during the first several days after discontinuing use, making it important to seek immediate professional help from trained Vicodin-detox professionals. While recovery from Vicodin addiction can be painful; the right procedure significantly reduces discomfort. Anesthesia Vicodin detox is a procedure that is effective at reducing the pain normally associated with Vicodin detox. How do I choose a Vicodin-detox program? If you are using opiate drugs to control pain and feel you are using more and more to obtain the same pain relief, you may be suffering from a common condition caused from opiate drug use; read about this condition called Hyperalgesia. Also, read about hormones and how the chronic use of opiate drugs can decrease the body’s ability to produce the proper amount of testosterone and estrogen. We never use other replacement addicting opiates often prescribed by physicians and detox centers, such as Suboxone®/Subutex (Buprenorphine) or injectable Buprenorphine. These schedule III controlled opiate drugs are routinely and widely used and approved by the FDA for opiate addiction maintenance, like Methadone. Many patients find themselves in the same situation as they were before drug treatment from a doctor or a drug rehabilitation center. We have heard of some in-patient rehab centers also using schedule II controlled liquid Hydrocodone and Dilaudid “cocktails”. Patients soon realize these replacement drugs cause severe withdrawal once they are discharged from these programs. This causes the patient to seek opiates for relief from the severe discomfort of a Buprenorphine withdrawal. The use of these drugs for treatment of opiate addiction is merely switching one opiate drug for another setting the patient up for failure. This does not solve the patient’s drug addiction problem. As use of these drugs become more common, we are seeing a steady increase of requests for anesthesia detox from patients addicted to Suboxone®/Subutex (Buprenorphine). With RDD’s Naltrexone Therapy used as a pellet/implant, injectable “IM” shot or the oral pill form, the patient stays clean and cravings are eliminated.